Who invented the Microchip? The name of the inventors of the Microchip are Jack Kilby (1923 - 2005) and Robert Noyce (1927 - 1990). Jack Kilby and Robert Noyce independently invented almost identical integrated circuits at nearly the same time and are therefore credited as being the co-inventors of the microchip. The invention would become known as the "Monolithic Idea". Jack Kilby: Jack Kilby and Texas Instruments filed for a patent on February 6, 1959 and received U.S. patent #3,138,743 for miniaturized electronic circuits. Robert Noyce: Robert Noyce and Fairchild Semiconductor corporation filed for their patent on July 30, 1959 and received U.S. patent #2,981,877 for electrical circuit structures incorporating semiconductor devices. The two inventors and their associated companies wisely decided to cross license their technologies after several years of legal battles and created a global market worth trillions of dollars. Definition of the Microchip: The Microchip is defined as is a unit of miniaturized electronic circuits (usually called an integrated circuit) that is manufactured from a material such as silicon or germanium at a very small scale. The purpose of the microchip was to reduce the amount of space taken up by electronic components and circuits. The interconnected electronic component are etched or imprinted on a onto a tiny chip of a semi-conducting material, such as silicon or germanium, and then built layer by layer on a wafer of the material. Fact 1: Definition of the Microchip: The Microchip is defined as is a unit of miniaturized electronic circuits (usually called an integrated circuit) that is manufactured from a material such as silicon or germanium at a very small scale. Fact 2: Purpose of the Microchip: The purpose of the microchip was to reduce the amount of space taken up by electronic components and circuits. The interconnected set of electronic components are etched or imprinted on a onto a tiny chip of a semi-conducting material, normally silicon, and then built layer by layer on a wafer of the material. Fact 3: Who invented the Microchip? Prior to the invention of the Microchip, the integrated circuit, electronic computers were absolutely massive. The invention of the microchip enabled computers to be made that were small enough to fit into the average sized room in a house. Fact 4: Who invented the Microchip? Without the microchip our world would be a completely different place without home computers, ipads, cell phones, smartphones, the world wide web with online shopping or banking. Fact 5: Who invented the Microchip? Jack Kilby, was born on November 8, 1923 in Jefferson City, Missouri, United States and died on June 20, 2005. Robert Noyce, was born on December 12, 1927 in Burlington, Iowa and died on June 3, 1990. Fact 6: Who invented the Microchip? In the 1950's many scientists realized that was a limit on how small a Transistor could be made, given that it had to be connected to wires and other electronics. Jack Kilby and Robert Noyce, working completely independently from each other, developed the idea of creating a whole, miniature circuit with the wires and everything else they needed in just one step. Fact 7: Who invented the Microchip? Jack Kilby and Robert Noyce simultaneously started work on inventing miniaturized electronic circuits, usually called integrated circuits, which would become known as the microchip. Fact 8: Who invented the Microchip? The idea of an integrated circuit (microchip) was first conceptualized by the British electronics engineer Geoffrey Dummer (1909 - 2002) who conceptualized the possibility of fabricating multiple circuit elements on a semi-conducting material such as silicon. Geoffrey Dummer presented his work at a conference in Washington, DC in May 1952, six years before Jack Kilby and Robert Noyce patented their similar inventions. As a result of his pioneering work Geoffrey Dummer has been called "The Prophet of the Integrated Circuit" or the Microchip.. Fact 9: Who invented the Microchip? Jack Kilby: The early years of Jack Kilby were spent in Jefferson City, Missouri, United States where he was raised by his family. 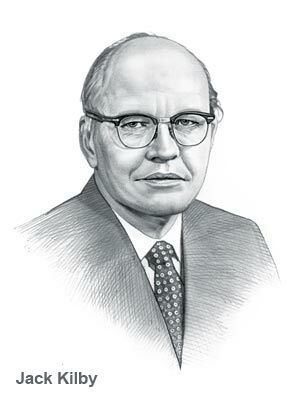 Jack Kilby was educated at University of Illinois and the University of Wisconsin. In 1958, Jack Kilby and his wife moved to Dallas, Texas, where he took job with Texas Instruments. In 1958, Jack Kilby and his wife moved to Dallas, Texas, where he took job with Texas Instruments, which offered Jack the opportunity to work on electronic component miniaturization. Fact 10: Who invented the Microchip? Jack Kilby: Jack Kilby had only been working for Texas Instruments (TI) for one month when most of it employees began their summer vacation. As he was new to the company Jack Kilby had no vacation time due so, working alone in the lab, in July 1958,he began to familiarize with the projects and research that had already been conducted by Texas Instruments. Fact 11: Who invented the Microchip? Jack Kilby: Texas Instruments had discovered that several electrical components could be built from silicon, although at the time they were only interested in developing their work on transistors. The transistor was invented in 1947 and Texas Instruments had been hugely successful in manufacturing the first transistor pocket radio that used transistor-based circuitry. Jack Kilby suddenly realized that all parts of a circuit, not just the transistor, could be made out of silicon. Fact 12: Who invented the Microchip? Jack Kilby: Jack Kilby compiled a list of all the electrical components that could be built from silicon. The list included not only transistors but also diodes, resistors and capacitors. His colleagues at Texas Instruments returned from vacation, but Jack Kilby's idea was received with considerable scepticism due to the, seemingly impossible, problem of mass manufacturing complex transistor circuits. Fact 13: Who invented the Microchip? Jack Kilby: Jack Kilby was persistent and conceived the idea of eliminating the wires between all the parts and cramming them into a much smaller space. His boss was impressed with his idea and gave him the 'go-ahead' to build a working model. By September 12, 1958 Jack Kilby had built a working model of what would become known as the Microchip. Fact 14: Who invented the Microchip? Jack Kilby: Jack Kilby's dawning of realization would become referred to as the "Monolithic Idea". The Monolithic Idea occurred, independently, to Robert Noyce at Fairchild Semiconductor corporation just weeks later. The Monolithic Idea was the Microchip. Fact 15: Who invented the Microchip? Robert Noyce: Robert Noyce was educated at Grinnell College and the Massachusetts Institute of Technology (MIT). His first job was at the Philco Corporation and then in 1956 started working for the Shockley Semiconductor Laboratory in Palo Alto, California, making transistors. Fact 16: Who invented the Microchip? Robert Noyce: Robert Noyce quickly moved on to co-found the Fairchild Semiconductor corporation in 1957 with entrepreneur Sherman Fairchild, who was the head of Fairchild Camera and Instrument Corporation. Fact 18: Who invented the Microchip? Robert Noyce: Robert Noyce improved the concept of connecting all the components by evaporating the lines of conductive metal (the "wires") directly onto the silicon wafer’s surface. This manufacturing technique invented by Robert Noyce, that produced diffused junctions in semiconductor devices, became known as the planar process. Fact 19: Who invented the Microchip? Jack Kilby and Texas Instruments (TI) filed for a patent for their invention for "miniaturized electronic circuits" (the Microchip) on February 6, 1959 and received U.S. patent #3,138,743. Robert Noyce and Fairchild Semiconductor corporation filed for a patent for "electrical circuit structures incorporating semiconductor devices" (the Microchip) on July 30, 1959 and received U.S. patent #2,981,877. Fact 20: Who invented the Microchip? The two companies became involved in a prolonged court battle over the invention of the Microchip which was eventually settled in 1966 when they agreed to share ownership of the invention. It was also agreed that Kirby and Noyce both deserved credit for the invention of the Microchip, but this was a continued matter of debate by members of the scientific community. In 1968 Robert Noyce left Fairchild Semiconductor corporation and co-founded Intel with Gordon Moore. Fact 21: Who invented the Microchip? In 2000 Jack Kilby became a Nobel Prize laureate for his invention of the integrated circuit. Robert Noyce had died on June 3, 1990 and was not honored with this prestigious award. Jack Kilby died on June 20, 2005. Impact: How did the Microchip impact the world? The impact of the invention of the Microchip, the "Monolithic Idea", was a highly influential step to improving the field of Computing and Technology by becoming a vital component in computers and other electronic equipment. Without the Microchip there would be no Silicon Valley, no Intel, Apple, Microsoft or Google or personal computers, cellphones, television sets, PlayStations or many other electronics we now take for granted.